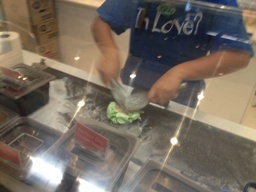 If you haven't been to Cold Rock Icecreamery yet then you have no idea what you are missing out on! 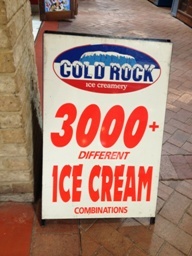 Not only is Cold Rock icecream delicious you can choose from a range of sweets to be crushed up over a ice cold surface and mixed into your icecream - this means there is over 3000+ flavour combinations so you never have to get tired of popping in for an icecream treat. Mix it sweets include, maltesers, freckles, sour worms, nerds, bounty, M&M's and heaps more! And I can tell you when you mix your favourite sweet (or favourite 2 or 3 or more sweets), with your favourite flavour of Cold Rock icecream is just to die for. I'll admit I am a bit of a specialist in the area of icecream tasting, and can promise you, you wont be disappointed and will want to go back again and again to try all the different combinations - well maybe not all of them this might take a few years or decades lol! 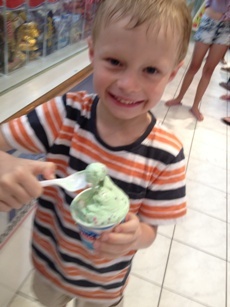 On this occasion, we visited the Hillarys Boat Harbour Beach, my 6yo concocted a mix of sour worms, nerds and choc mint icecream - there were certainly no complaints there. Myself and my 2yo shared a vanilla and freckle mix - I really should have got my own because I don't think my son got to have much of it!! They have a great little kiddies size available - which I think was more than enough even for me! Step 1 - Choose Your Flavour! Step 2 - pick your treat (or treats) and watch them get crushed into your favourite icecream flavour! They also can turn your favourite flavour and treat combination into a cake for that special occasion! Find out more about Cold Rock Ice Cream Cakes. The kids loved watching their creation being made - and always ask to go back after a swim at Hillarys Boat Harbour beach! Go on, go and get one you know you want to! What's Your Favourite Cold Rock Combo? 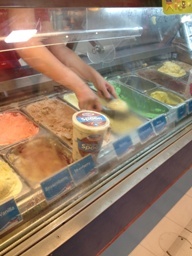 Share your favourite Cold Rock flavour and treat combination with us! We'd love pictures you can add them below but you don't have to!